In the benedictional from Regensburg, a miniature depicting Pentecost appears before the text of the blessings for that holiday. From the concentric circles of the arc of heaven, flames of thick golden rays and thin red lines stream toward the twelve apostles gathered below. As the Gospel texts describe, the Holy Spirit descends as tongues of fire on the apostles' heads. 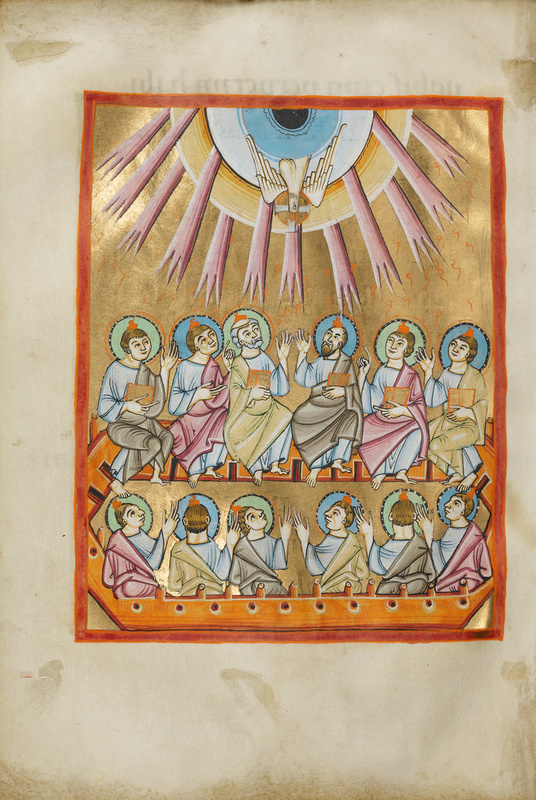 In this representation the illuminator carefully differentiated the two most important apostles, placing them prominently in the center of the top row. Peter, just left of the center, is balding, gray-haired, and wears a short beard, while Paul, at right center, has a receding hairline and a longer, dark beard. On the bottom row the illuminator organized the figures symmetrically, alternating colors and poses to maintain pictorial balance.